The 2018 Small Parish Forum was held from 3:00 PM on Thursday July 12 through noon on Saturday July 14 at St. George Cathedral (OCA Bulgarian Diocese) Rossford OH. 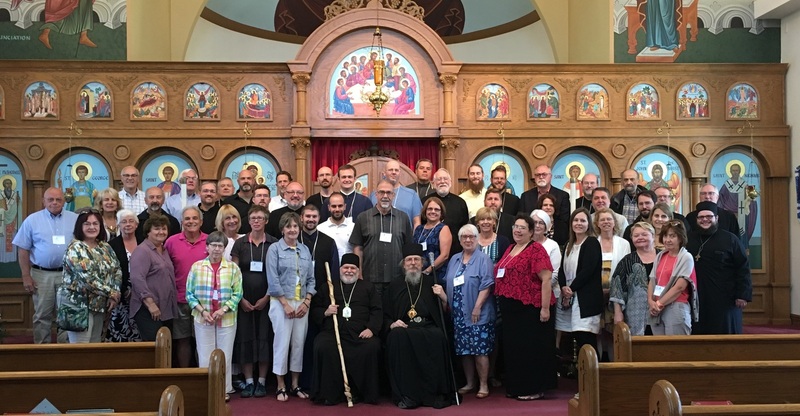 The 2018 Forum was sponsoredby the Archdiocese of Western Pennsylvania, the Diocese of the Midwest and the Bulgarian Diocese of the OCA. The Small Parish Forum is a conference that offers presentations, discussions, workshops, small group sessions and individual conversations tuned to the challenges faced by small Orthodox churches. Clergy, parish council members, Christian educators and concerned laity from many OCA Dioceses and Orthodox jurisdictions attend to become good stewards of their parish future and help them recognize and harness what is good and beautiful in small Christian communities. 2016 Parish Forum attendee shares hopes for the future of her parish with interested Forum attendees. The Small Parish Forum is unlike other events dealing with church ministry and revitalization. The Forum is NOT about telling small parishes of their necessity to grow. Nor does the Forum allow participants to dwell on the difficulties and limitations of small parishes. The Forum provides tools, insights and encouragement that enable small parishes to harness the intimacy and close relationships inherent in their modest size. Because the forum attracts attendees from many small parishes, Forum attendees are reminded they are not alone in the challenges faced in their parish. They share how other small Orthodox parishes are beginning to make progress on these challenges. To view materials from 2018 Forum click here. To view materials from 2017 Forum click here. To view materials and photos from 2016 Forum click here. To view photos and materials from the 2015 Small Parish Forum -- click here. To View Photos and materials from 2014 Small parish Forum Click Here.